You can watch all the great videos with Dr. Barkley here … I am a big fan of Dr. Russell A. Barkley, Ph.D., which may not come as any kind of a surprise to many of my readers, since I reference him a lot. 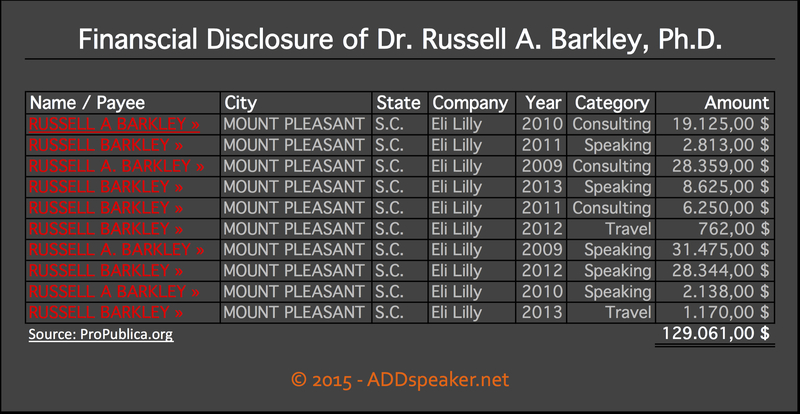 Unfortunately, I hear some negative feedback on him as “being in the pocket of Big Pharma” due to his work for and with Eli Lilly, so I decided to take a closer look at the extent of it, and here’s what I found; Nothing suspicious to report – nothing to see here – move along now! I myself, have made even more on a yearly basis, as a corporate consultant on People Change Management, than Dr. Barkley did in the period in total, from 2009 – 2013, so I don’t believe (nor have I found any shred of evidence to the contrary) that he is overwhelmingly financially influenced by these incomes. I don’t state this to brag, but to put his earnings into perspective. Note that most of his income comes from consulting and speaking, not research for them! There is nothing (new) here to be suspicious of, in anyone’s objective opinion, and since I have no ties to Dr. Barkley (or any other interests), nor do I have any connections to any pharmaceutical institutions, although I used to work for the Danish Pharmaceutical Company – Novo Nordisk (Eli Lilly’s biggest competitor on the Diabetes and Insuline market, globally, in their HQ in Denmark, but in their IT department, and long before I even knew I had ADD myself. I have been giving Dr. Barkley’s permission to interview him on the subject, and here is what he wrote me, on that topic, today! […]I do occasionally consult with and speak for various pharmaceutical companies. To say I am in bed with them is misleading as it implies that I work for them exclusively or a majority of my time and I certainly have not. But I will teach anyone about ADHD and advise researchers on their research when it seems I can be helpful in doing so. The monies received from pharmaceutical have never exceeded 15% of my annual income during any calendar year and in the past 3 years has been well below as I have cut back accepting travel now that I am older and do no wish to do so as much. It’s odd that critics never mention that I receive more income annually from books on parenting ADHD and related disorders and clinical manuals and handbooks filled with psychosocial treatment strategies than I do from pharma, but that fact would disprove their narrative, which is to dismiss my opinion as entirely biased toward medications due to speaking at events sponsored by manufacturers. […][/quote] Russ Barkley, Ph.D. Taking the time to answer me, within 24 hours, on this question, which must be such a nuisance, just goes to show, to me personally at least, how dedicated Dr. Barkley is to helping our world-wide ADHD community, when you take into consideration that I am just another “patient” from a far off country, with a no-name blog! Now please stop taking focus from the credit due, for his more than 40 years of research and treatment, to major benefit for those of us, like you and I, than benefit daily from his long and dedicated service in the vast field of ADHD research! Dr. Barkley – Thank You! My own full disclosure can be found in the About tab on the menu!